– Is there any truth to the rumor that HBO has been following Timmy around for Drive to 200 documentary, if there isn’t there should be. All kidding aside, I am really looking forward to Wake collecting his 200th win (with all but 14 of them coming in a Red Sox uniform). It will be a time where we as Red Sox fans get to honor one of the greatest Red Sox players of all time and our generation. Wakefield has been pitching in Boston since 1995 and from the first time he stepped on a field in Fort Myers to this very day he has been nothing but a class act. Think about it, how many 200 win pitchers have been back in forth from starter to pen as much as Timmy? 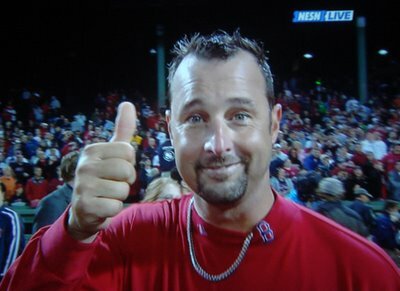 We have never heard a peep from this guy, if you want to sum up Tim Wakefield’s career look no further than him coming out of the pen in game 3 of the 2004 ALCS in that blow out loss to the Yankees. Wakefield gladly took the ball, ate some innings and took a little beating just so the Sox would have some fresh arms to attempt a comeback from down 0-3 (we all know what happened), a class move by a class guy and I couldn’t be happier for any player. Also in today’s game of free agency and changing pitchers every batter who knows when we will see one of our own reach this mark. -Speaking of Wake, what’s up with Tito pulling him with one out left in the 7th? I hate people who criticize managerial decisions, because lets face it there is a reason we are all where we are and Tito has 2 rings, but in my opinion with the circumstances considered you have to either let him finish the 7th or give it up to the bullpen after 6 and let them try and protect that 1 run lead. I know Terry was going for the win, and once the calendar hits turns to August thats the play but seeing how it turned out and Gordon Edes tweet about Wake having a 49 ERA or something after pitch 85 I think the skipper might have handled it differently if given a second chance. – Is Asdrubal Cabrera starting to annoy people as much as he annoys me? It is to his credit though, he is having a great season and his killing the Red Sox. -I have to admit, I enjoy baseball when the Indians are competitive. They have a strong fan base and it is fun to see the Jake rockin night in and night out. The city of Cleveland is definitely miserable, but in the last 15 years or so the Indians have been right in the middle of some great Red Sox story lines. The two clubs matched up twice in the post season in the late 90’s, with the first round going to the Sox (who can forget Pedro’s memorable relief appearance leading the Sox to a Game 5 victory) and then saw Cleveland knock the Sox out of the playoffs the following year on the back of then Indian Manny Ramirez (Manny was on the Sox payroll 2 months later). Then 8 years later the Sox were able to comeback from a 3-1 deficit in the 2007 ALCS, a dramatic 7 game series headlined by a couple dominating performances from Joshua Patrick Beckett and some clutch hitting against that year’s Cy Young, C.C. Sabathia, and then stud Fausto Carmona. The intensity of this series reflects the solid season so far by this year’s Indians. – What’s up with Carl Crawford? I know he has killed the Indians this season and had a couple hard hit balls last night but once again we saw some very poor ABs out of him in important situations the past few nights. I’m pretty sure he walks into the box down 0-2 and I am starting to wonder if he has even seen a breaking ball until this season. Kind of strange out of perennial All-Star who made his dough off of crushing A.L. East pitching and now finds himself in a lineup which provides more protection. (Not to mention he is killing me fantasy team). – Not only was last night the second straight walk off win for the Sox, but it was also the second night in a row where we saw a great performance out of the pen by an unlikely candidate. Franklin Morales looked great pitching 2 scoreless innings on Tuesday and Randy Williams surprised me last night in his 1.1 innings of work. It is not the results that impress me the most, but the confidence these two displayed on the mound that have me excited. Theo has quietly put together a strong bullpen despite Jenks being a bum. -Finally, how can you not mention the hero of last nights game, Jacoby Ellsbury. I will keep this brief because I am sure I will be looking at it in more detail soon, but Ellsbury has quietly played himself into the MVP discussion. The timing couldn’t be better for Ellsbury either with talks of the Red Sox looking to sign the young CF to an extension, this season will be sure to test Theo’s wallet. The skill set is there (we always knew that), his defensive would be hard to replace, and he is doing it all offensively. While manning the lead off spot Ellsbury is hitting for average, driving in runs, and poking balls over the fence (18 this season, had 20 for his career coming into this year). Statistics are fun and everything, but my MVP needs to produce when the pressure greatest and Ellsbury certainly showed he can do that these past 2 nights, officially making it a two man race for MVP (ironically enough the other guy plays for the Sox too). The Sox will face a familiar foe in the series final tonight, as Justin Masterson (who is having a great season by the way) faces off against newly acquired Erik Bedard. The Sox look to take 3 out of 4 from the Indians. P.S. A buddy of mine recently played Minor League ball for the Sox and got invited to a couple spring trainings. He is full of some funny player stories but one of the better ones has to be the fact that Wakefield dominates the Jack Daniels. Wake loves himself some Jack and it is understood that nobody can enjoy a little Jack without the 199 game winner’s permission on team flights. Get after it Wake. I really appreciate this post. I have been looking all over for this! You’ve made my day! Thanks again! Keep up the great work , I read few articles on this web site and I think that your web site is real interesting and has lots of excellent information. I truly enjoy looking through this site. It has excellent content.